Microsoft Office Visio comes with a package of built-in content. Users of MS Visio supplied with a set of ready standard stencils. Standard Visio stencil contains shapes that are basically used to create specific diagrams. The stencils vary from simple drawing shapes or lines to more complicated objects like computers, network equipment or anything else that needs to be displayed in a graphical form. MS Visio provides users with a number of predefined stencils. Standard Visio stencils contain forms, which are mainly used for creating diagrams. Form can range from simple boxes flowchart or lines to more complex forms, such as servers, racks, or anything else that needs to be presented in graphical form. A stencil is a suite of objects associated with a certain MS Visio template. Stencils for versions 2010 and earlier are saved in VSS format. Stencils, in later versions of MS Visio, have a VSSX format. You can open MS Visio 2003-2010 VSS stencil using the Import options of ConceptDraw DIAGRAM. If you need to open a new VSSX stencil file, you can do this using the Import capabilities of ConceptDraw DIAGRAM for both platforms (Windows and macOS). Browse to desired MS Visio VSS or VSSX file to be imported. Click “OK”. 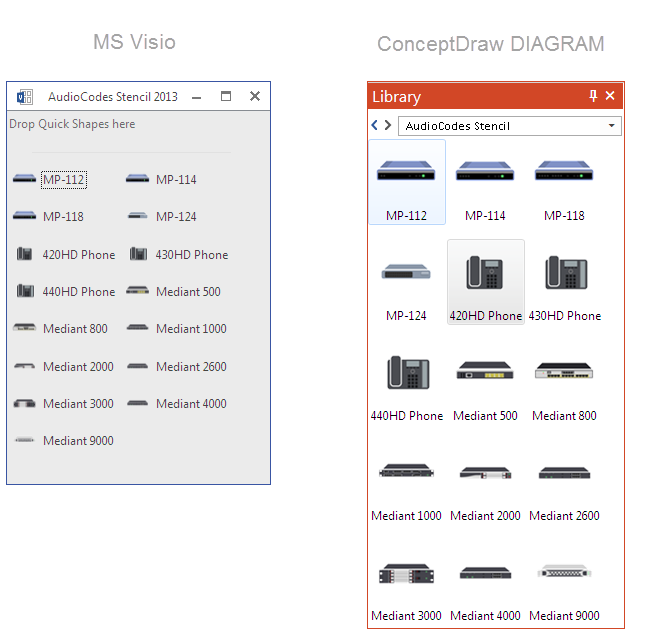 The MS Visio Stencil will be opened in ConceptDraw DIAGRAM. Result : Now you can proceed working with your Visio file on ConceptDraw DIAGRAM.